A combination of wash and solid colors. The translucent colors combined with refine finish lines, gives the tile a look as if has been in your home for some time. Hand-painted, colors are applied in layers with a final clear fine glaze. Size: 2 1/16" x 2 1/16", 3" x 3", 4 1/4" x 4 1/4", 6 1/16" x 6 1/16", 8 1/8" x 8 1/8", 12 3/8" x 12 3/8" average sizes. Material: Different specific clays are purified and mixed in order to have a quality bisque. Details: Hand-painted, details lines are firm but the color have a slight translucent look, to give it a slight worn-out look to the application, applied in layers with a final clear glaze: Semi-gloss or Matte finish gloss. Process: Tiles are fired three times during the process from the bisque to the glaze. The Red Bisques is fired in professional kilns. The manufacture of the the De Colores Tiles are well known for their innovations. De Colores Tiles bring a traditional but unique design look. The slight translucent application to some of the colors makes it seem as if it has been in your home or building for a long time, with the appearance of a well maintain tile. 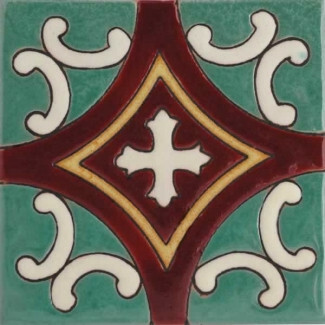 The slight modification to traditional designs will give your design a unique look but still keeping up with Spanish, Italian, Portuguese, Central America and Mexican tile designs. From the bisque to the glazes this tile are quality. No lead is used or added to the materials, the colors or the glazes.